SpeakerTalk :: View topic - unkown speaker, celef, monitor audio, kef ,prototypes? unkown speaker, celef, monitor audio, kef ,prototypes? 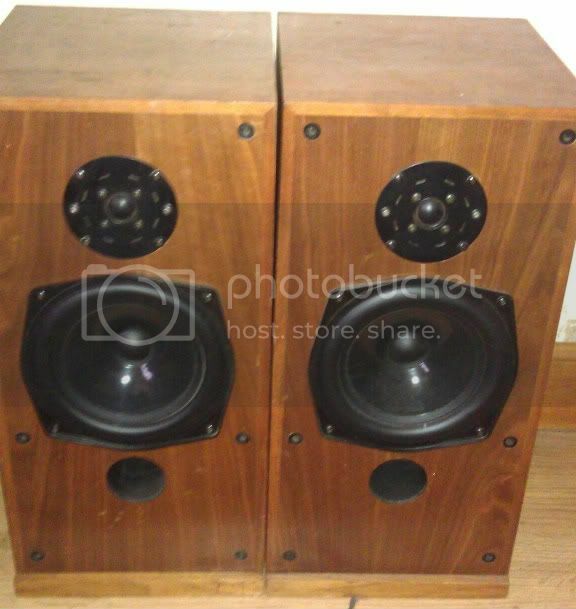 Posted: Mon Dec 01, 2014 12:13 am Post subject: unkown speaker, celef, monitor audio, kef ,prototypes? he also said his dad was given them by someone in the speaker business that he knew a long time ago . any suggestions on crossovers that could utilize the sp1054 and sp1032 in the 45L vented enclosures would be very much appreciated . Makes me wonder. If the Calinda is using an ABR and was properly designed, it means the SP1054 needs a rather long vent in that enclosure size. How can this driver properly tune with that vent? But that's about the low end of the spectrum. Regarding the crossover, the Calinda crossover is said to also have an aB compensation so should not be a bad start. thanks for the response , i agree that the port would need to be long to give similar resistance to the abr , the port in these is a touch over 200mm , thats a pretty long port that would almost cause aperiodic loading , i have mocked up a copy of the calinda low pass filter with notch filter , it works well , sadly the seas tweeter (which is better suited to 3 way arrangements) simply doesnt integrate happily as it seems a bit to uneven toward the cross over point which is giving a 'peaky' sound at certain frequencies that colour the sound unacceptably , so i think the calinda crossovers and some t27 sp1032's will be the way to go as a start point .